Red beryl in rhyolite from the Violet Claim, Wah Wah Mountains, Beaver County, Utah, UMNH.MC.0525, donated by Alfred Buranek; located in the Utah exhibit. Photo © NHMU by David W. Richerson. You might not know it, but in addition to our incredible dinosaur, insect, plant, and anthropology collections, the Natural History Museum of Utah has a "gem" of a mineral collection. This excellent and diversified collection contains more than 5,000 mineral specimens from around the world. Most were donated in the late 1970s and early 1980s by Alfred Buranek, a Utah geologist, author, and mineral collector. Since then, a number of smaller donations have augmented our collection. Aragonite, Lion Hill, Ophir Canyon, Tooele County, Utah, UMNH.MC.1592, donatedby Alfred Buranek; located in the Utah exhibit. Photo © NHMU by David W. Richerson. The third-floor display is just a small sampling of the diversity of minerals in the collection. In order to show the whole range of chemical compounds represented by minerals, a cabinet with 45 drawers was installed in the Earth Lab on the 2nd floor. Each drawer contains 16 spaces for specimens and supportive photographs. Forty of the drawers are organized according to their chemistry, ranging from native elements such as gold and silver to tungstates, molybdates and vanadates. In between are sulfides, carbonates, sulfates, phosphates, oxides, silicates and others. The remaining five drawers exhibit specimens collected in Utah. Each drawer is covered with plexiglass so that the specimens can be inspected close up without risk of damage. Smithsonite, Zacatecas, Mexico, UMNH.MC.0965, donated by Alfred Buranek; located in the "All the Colors of the Rainbow" exhibit. Photo © NHMU by David W. Richerson. While certainly a great resource for geology students, the Earth Lab drawers are a fabulous way for anyone to explore nature's mineral diversity. Many drawers contain more than one specimen to show the variety of ways minerals occur, including how they often grow alongside and through other minerals. For example, pyrite can form in cubes, octahedrons, pyritohedrons and combinations of crystal forms. 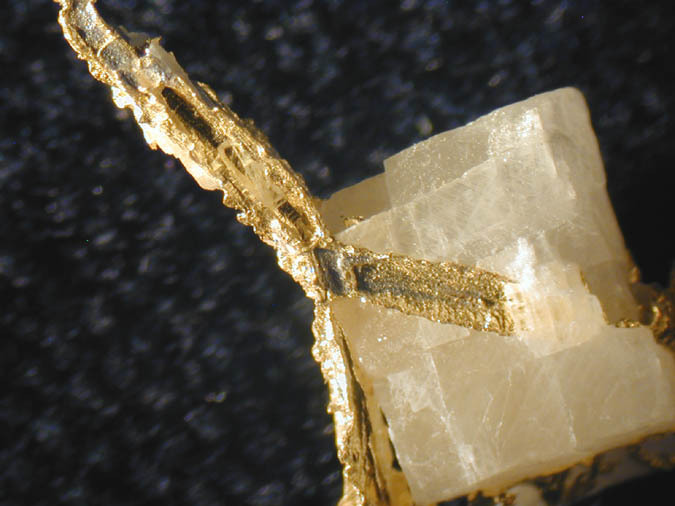 Gold can be tiny flakes and grains dispersed in the rock or distinct crystals, wires or ribbons. The chimeric mineral beryl can be green (emerald), blue (aquamarine), yellow (heliador), pink (morganite) or red (red beryl, sometimes called red emerald). Not to be outdone, quartz can be almost any color and can sometimes have inclusions of rutile, chlorite or other crystals. Close-up showing labeling and specimen variety. Photo © NHMU by David W. Richerson. In addition to these rich displays, most of the mineral collection is not on exhibit. Stored in drawers in the Geology and Paleontology Collections storage area, these minerals can be viewed by special arrangement. Once each year for two days in November, two of the 19 cabinets are opened during our Behind the Scenes event and are typically viewed by around 4,000 visitors. In order to better share the less-viewed minerals and fossils in our collection, we are now displaying "Featured Mineral" and "Featured Fossil" through the two windows along the 3rd floor corridor by the elevators. These dispays are changed every one to two months. 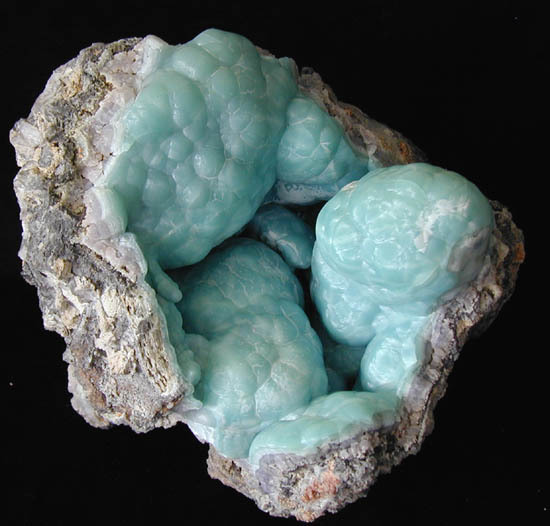 To date, the minerals calcite, fluorite, benitoite, prehnite and apophyllite have been highlighted. Example of gold specimen in Earth Lab drawer 1. Photo © NHMU by David W. Richerson. Several projects are in progress for minerals. 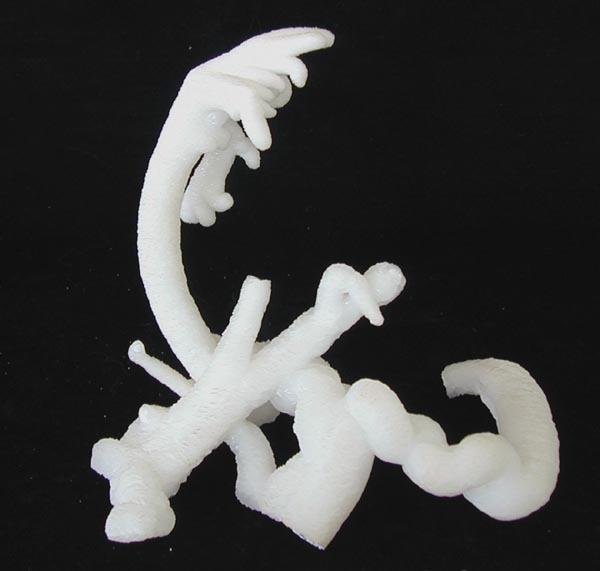 One is to complete an updated inventory and to enter comprehensive information for each specimen into a new database. A second project is to complete organization of the specimens in the storage cabinets according to their chemistry and to cross reference the location of each specimen with the database. A third project that is just beginning is to establish in two cabinets an archive of specimens from Utah according to county and specific locality. The intent is for this to be a valuable reference and research tool. 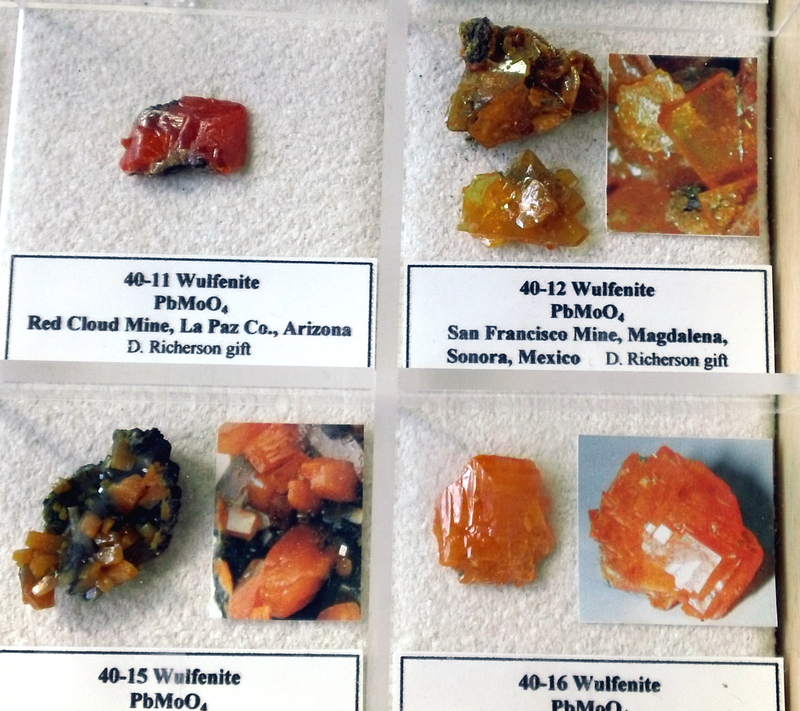 Unfortunately, many minerals and localities for Utah are not currently represented in the collection. They are probably tucked away in basements and old collections. We are hoping you rock and mineral enthusiasts will come forward to help us access these historical Utah specimens and work with us through donations and information to make the archive collection project a success. Please email me at . David W. Richerson is a retired Adjunct Associate Professor for the University of Utah Materials Science and Engineering Department and is the Manager of Minerals at the Natural History Museum of Utah in Salt Lake City. Our mission is to illuminate the natural world and the place of humans within it. In addition to housing outstanding exhibits for the public, NHMU is a research museum. Learn more.